The Laconia Roadhouse has finalized the entertainment lineup for the 94th Anniversary of Laconia Motorcycle Week, taking place June 10–18, 2017. As in years past, there will be no shortage of entertainment all day every day for the duration of the rally at the Laconia Roadhouse. Presiding over and announcing all the mayhem, legendary emcee Jack Schit is back to man the main stage at Laconia Roadhouse, introducing live music and overseeing contests and special events. 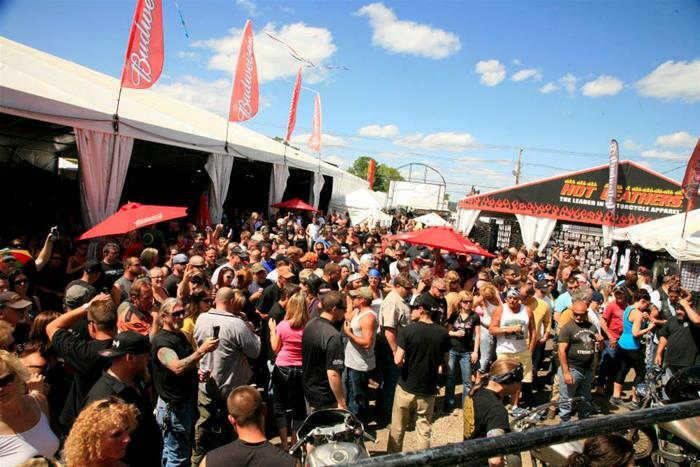 Featuring the best audio production quality during Laconia Motorcycle Week, the main stage will host live music from major regional acts every day, starting at 1 p.m., and the rock won’t stop until the beer runs out. Some of the musical acts at this year’s rally include Southern Breeze, Annie Brobst Band, Hypercane, Herland Brothers, Josh Logan Band, the Boneshakerz and many more. Laconia Roadhouse is also proud to welcome Indian Motorcycles this year. They will be on property for the week with their full display of bikes, and Indian reps will be on hand to answer questions, talk bikes and join in the fun. Returning rallygoers know that, for the duration of LMW, the world-famous wet T-shirt contest goes down every day at 4 p.m. on the Laconia Roadhouse Main Stage, and now patrons can look forward to mud wrestling as well. Newcomers and veterans both can enjoy some adult entertainment after a long day riding through the White Mountains of New Hampshire. Back for the third year in a row, the Flaunt Girls—billed as “part burlesque, part cirque and all tease”—will take to the Laconia Roadhouse Main Stage every night at 8:00 p.m., dazzling the crowd with a fun-filled 45-minute routine including aerials and dance numbers guaranteed to get every biker fired up. If last year’s performance is any indication, everyone will be talking about the Flaunt Girls as they perform exclusively at the Laconia Roadhouse during Laconia Motorcycle Week 2017. The Laconia Roadhouse complex has always enjoyed a reputation for great ambience and even better meals. Building on the reputation of excellence earned with the Lobster Pound and Laconia Roadhouse, Owner–Operators Richard and Mike Ray have now created a preeminent Italian dining experience. Faro Italian Grille opened last year and features family recipes and the freshest local ingredients, a wide variety of menu items to accommodate all tastes and dietary restrictions, and large seating and bar areas that allow for the servicing of bigger parties. And a meal at Faro Italian Grille serves as the perfect warm-up to the recreation and enjoyment waiting at the Laconia Roadhouse. Laconia Motorcycle Week 2017 kicks off Saturday, June 10, and runs through June 18. No dyed-in-the-wool motorcycle enthusiast wants to miss it. The Laconia Roadhouse and Faro Italian Grille serve as the entertainment and food-and-beverage focal points for Laconia Motorcycle Week®. Owned and operated by Richard and Mike Ray, this tandem has provided patrons of Laconia Motorcycle Week® with the best in live entertainment and fine dining for 30 years. Visit both enterprises online at www.laconiaroadhouse.com and www.faroitaliangrille.com, and be sure to like them on Facebook.